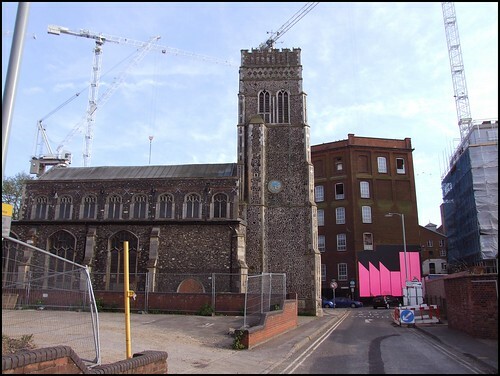 Back in 1999, I said in an early version of this article that St Mary at Quay had surely the most urban and industrial setting of any East Anglian church. It was, and is, a grubby little jewel, and its setting in a sea of concrete and high-rise, surrounded by factories and dual-carriageways, created quite a contrast. When I first moved to Ipswich in the 1980s, this was a busy area, a hive of industrial activity. Immediately opposite the church was the Cranfield factory; they made animal feed, and a bit further down was Paul, the malsters. To the west was the white tower of Burton, the confectionery factory. On crisp winter mornings the air was full of sweetly fragranced steam, the smell of Wagon Wheels and Jammie Dodgers being made. The waterfront, behind the factories, was increasingly moribund, with the larger boats no longer able to negotiate the lock gates. Still, you might see grain ships from Hamburg, or timber being offloaded from Soviet Russia, the sailors on the decks mysterious as they looked wistfully out at the town centre skyline. At the end of the docks was the Tolly Cobbold brewery, another set of sweet smells and activity. Today, almost all of that activity and setting has gone. The dock has become a busy upmarket marina, and St Mary sits on the edge of what became the largest building site in the east of England, the regeneration of the Ipswich docklands. Not without controversy, the Waterfront Development changed the face of Ipswich. The vast factory complexes made way for high rise apartment blocks and loft conversions. The brewery has stood empty these last twenty years. There are restaurants and retail spaces, a dance theatre, and most of all a new University. 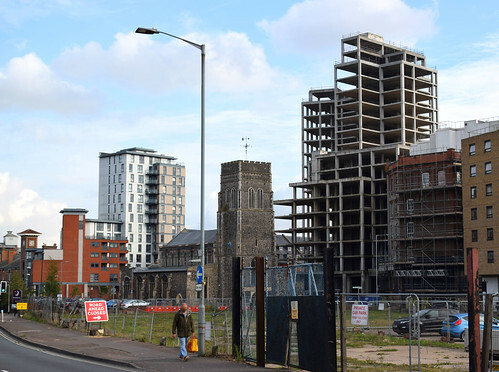 Although most of the development, which stretches around all sides of the Wet Dock, is no more than ten storeys high, the Mill, a centrepiece tower not far from St Mary which rises to an amazing 25 storeys, is the highest residential block in the east of England. Beside it stands the wine rack, twelve storeys of concrete shell, abandoned when the economy collapsed in 2008 and no doubt one day either to be demolished or finished. A completed 12 storey block stands beyond that, and can be seen in the photograph at the top of the page. A regeneration scheme on this scale, especially where the land has had hundreds of different owners and must be bought up painstakingly by the developers, inevitably causes a lot of planning blight. To visit this church any time in the last ten years has been to see it surrounded by a wasteland of overgrown empty lots, and only the dual carriageway gives the scene life. 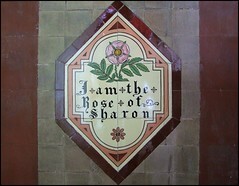 And yet, St Mary at Quay is very beautiful, and would be much admired and better known in a different setting. It has a pretty little tower, delicate windows and a beautiful clerestory. There are grand transepts. 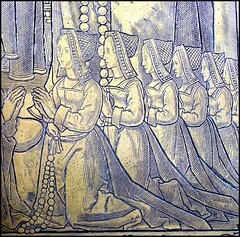 It is all of a piece, built in the 1450s. 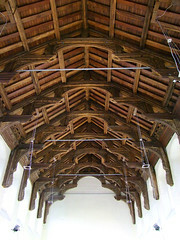 The hammerbeam roof is the original. This is Perpendicular writ small. 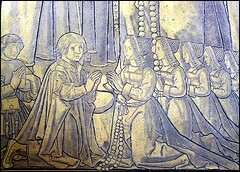 In Medieval times the dedication of the church was probably to Sancta Maria Stella Maris: Our Lady, Star of the Sea. 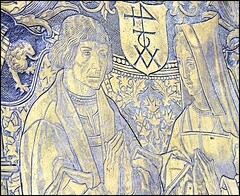 The wealth of 15th and 16th century merchants like Henry Tooley and Thomas Pounder left their mark, in the form of fine fittings and magnificent memorials. 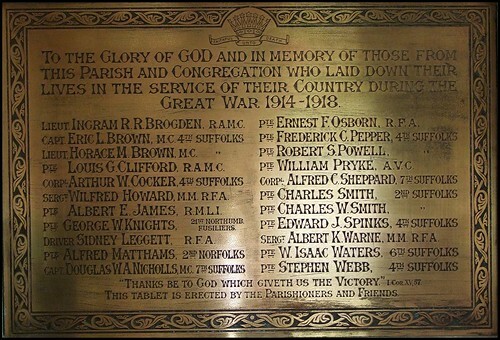 These can now be seen in Ipswich Museum, and there is a replica of the Pounder brass on view in the church. 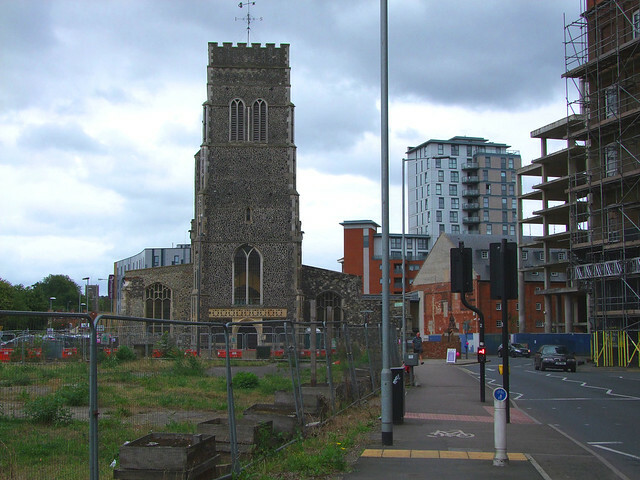 St Mary at Quay has been out of use for longer than any other Ipswich church. 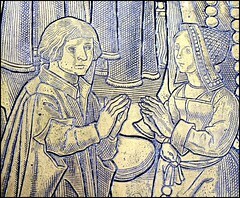 The church was restored rather primitively in the 1870s, but this restoration failed to address the greatest problem of the church. It is built on such marshy soil that it suffered from water ingress. 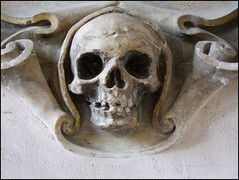 This was worst in warm, wet weather, when the church vaults would flood, filling the building with an unbearable smell. 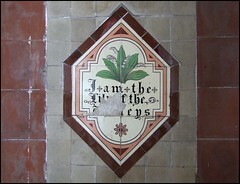 In 1898 the church closed, and the vaults were dug out and filled in to try and address the problem. But it recurred, causing frequent closures, until one night in 1943 when German bombs fell beside the little church, destroying the windows and causing other major structural damage. 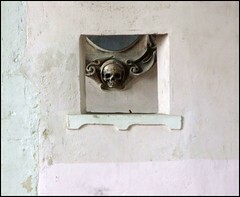 The church closed again, this time never to reopen for regular worship. 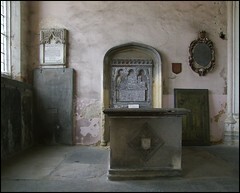 The fine set of benches went to St Andrew, Ipswich, where they can still be seen. 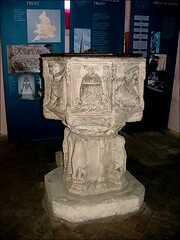 The traditional East Anglian late medieval font went to Brantham, although it has now been returned. The organ went to a church in Norwich. From the 1950s to the 1970s, the church was used as a hall by Ipswich Boys Brigade. Well into the 21st Century, the curious brick partitions in the south aisle were still visible as the remains of their internal dividing walls. 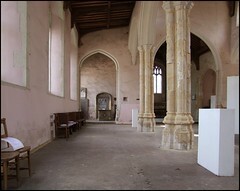 You could still see their badminton court marked out in the nave. 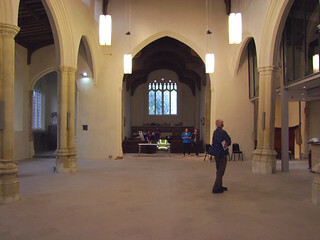 After its somewhat turbulent 20th Century, and to its eternal salvation, St Mary at Quay found itself in the care of the Churches Conservation Trust, their only Ipswich church. 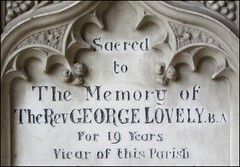 They gave the building a thorough restoration in the 1990s, and the church was rented out to Ipswich Arts who used it for exhibitions and art 'happenings' and Red Rose Chain Theatre, Ipswich's prominent alternative theatre company, whose home it became for several years. Their banked temporary seating, facing westwards, gave a stunning close view of Ipswich's finest medieval hammerbeam roof. In 2004, the building itself became an installation art project; geiger counters were put outside, and fitted up to the lighting system. They caused a flash of illumination every time background radiation was detected in the docklands air. This was pretty startling if you happened to be driving along the docks road at night, I can tell you. 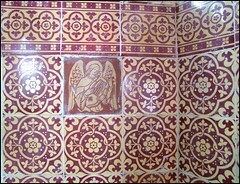 However, even as I was wandering around inside, it was becoming clear that the CCT's restoration was largely cosmetic. Decades of heavy traffic rolling past a few feet from the door as well as industrial activity on the soft ground around, coupled with the well-meaning but unfortunate misuse of a concrete raft to stabilise the foundations in the 1940s, meant that St Mary at Quay was crumbling and sinking, and something had to be done urgently. The repair bill would run into millions of pounds. 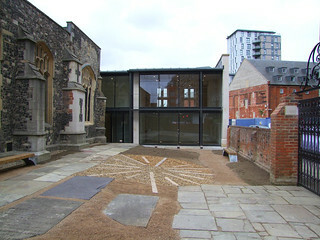 The Churches Conservation Trust went into partnership with the mental health charity Suffolk Mind, who applied for a Heritage Lottery Fund grant to convert St Mary at Quay into a well-being centre. They were awarded an astonishing £3.6 million, but even so a large proportion of the CCT's budget for the east of England was taken up with the project for a couple of years. 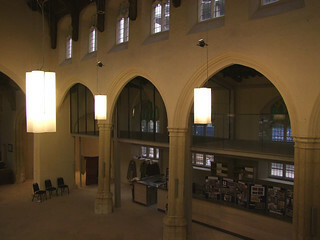 A glass mezzanine was put up in the south aisle, which leads through to a two-storey glass and flint office extension in the south-east corner. This is a bit alarming when viewed from the east, rather spoiling the harmony of the church's unified Perpendicular shape, but it could have been a lot worse. It seems almost to echo George Gilbert Scott's south transept on St Peter at the Waterfront a couple of hundred yards to the west. Work began in April 2014, and is expected to be completed by the end of 2016. 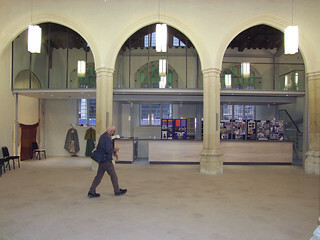 The building has been rebadged as Quay Place, and will be available for hire for exhibitions, concerts and so on. 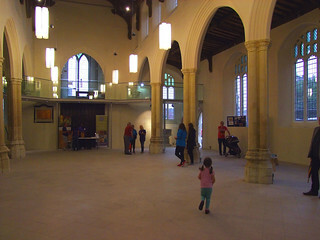 What access there will be for church explorers remains to be seen, although everyone involved in the project when I visited at Open Heritage Weekend in September 2016 seemed very friendly, even though they wouldn't let me go and have a look inside the new extension.